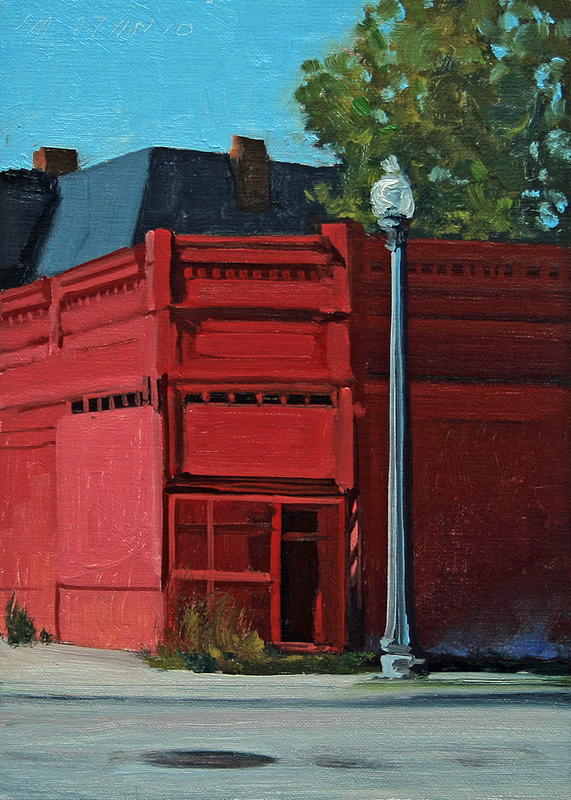 This daily painting is an urban landscape of a bright red corner building in the Brush Park area of Detroit. 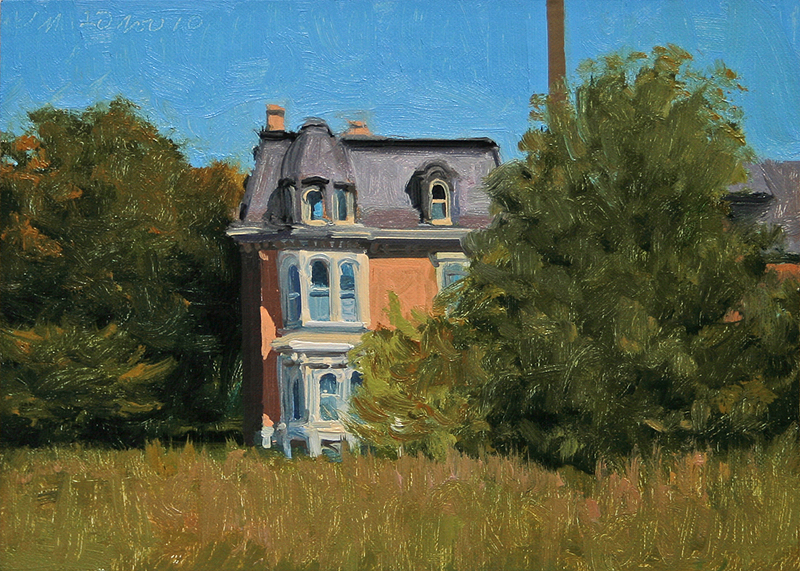 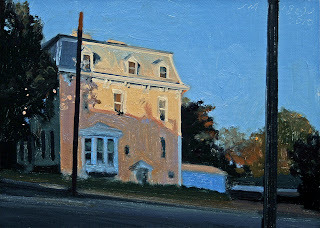 This daily painting is an urban landscape of a house with turret in Hagerstown, MD. The second Hagerstown painting. 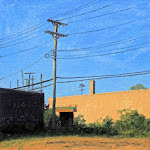 Inspired by our recent trip there to see the Architectural and Industrial Realism show I am in at the Washington County Museum of Fine Arts. 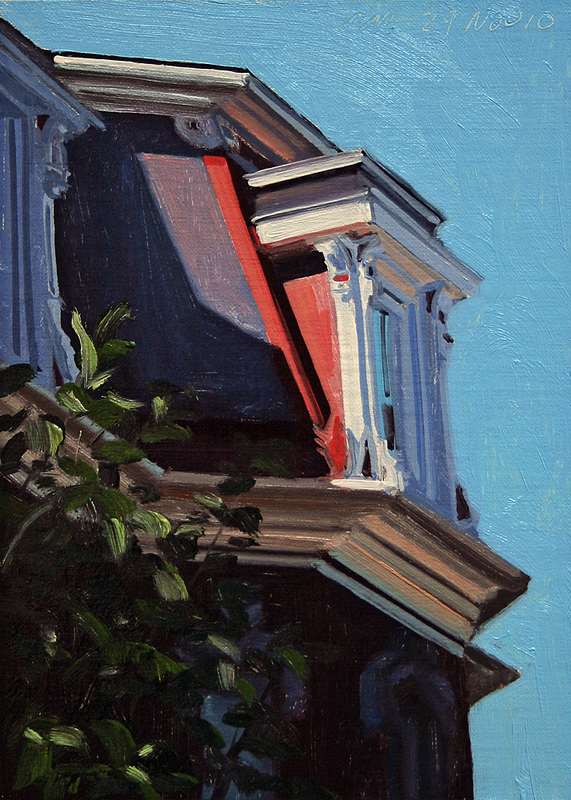 A delightful small museum in the middle of town in the city park. This daily painting is an urban landscape of a Yellow house in Hagerstown, MD. 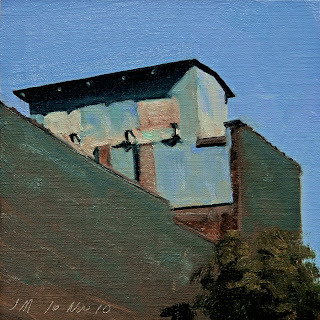 Inspired by our recent trip there to see the Architectural and Industrial Realism show I am in at the Washington County Museum of Fine Arts. 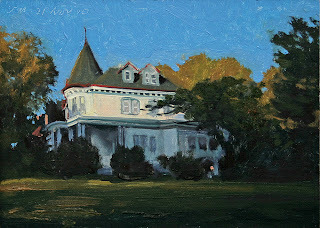 A delightful small museum in the middle of town in the city park. 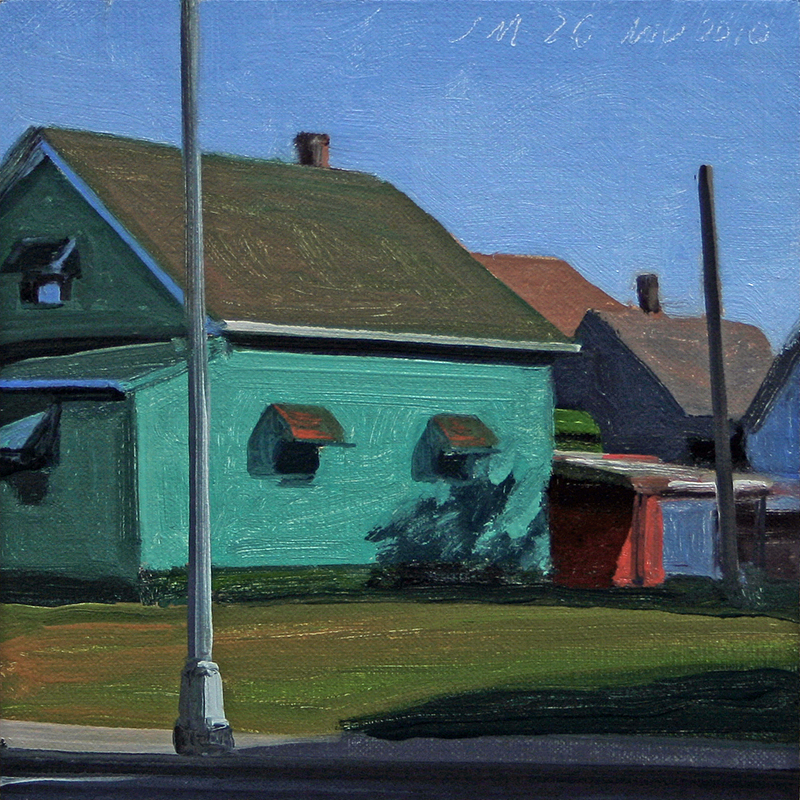 This daily painting is an urban landscape of a Turquoise house on Caniff St in Hamtramck. 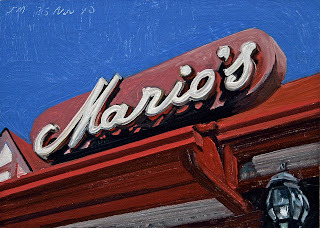 This daily painting is the sign for Mario's Italian restaurant on 2nd Avenue in Detroit. 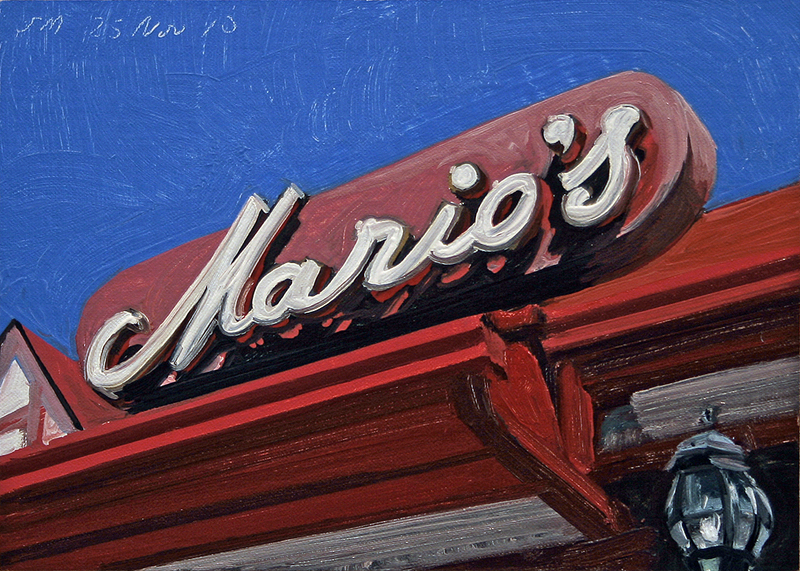 Mario's opened in 1948 and is an unpretentious, old-school kind of place. 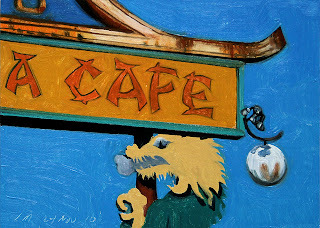 This daily painting is the old sign for Stanley Hong's Mannia Cafe, another abandoned business in Detroit. It opened around 1968, known as "Detroit's most beautiful Chinese-American restaurant" After closing the building became the Omega Baptist Church and then the Grace Fellowship Baptist Church. 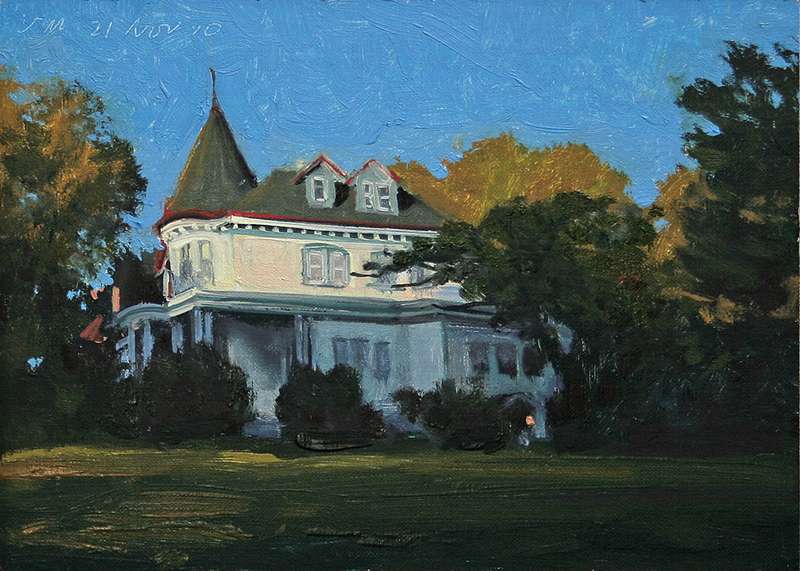 It is currently abandoned. 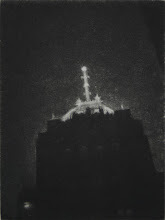 This is from a photo of mine taken in the mid 80's. 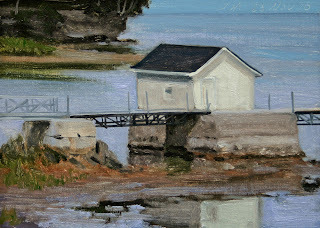 This daily painting is a landscape view of Lake Huron at Pointe Aux Barques on the tip of the thumb of Michigan. 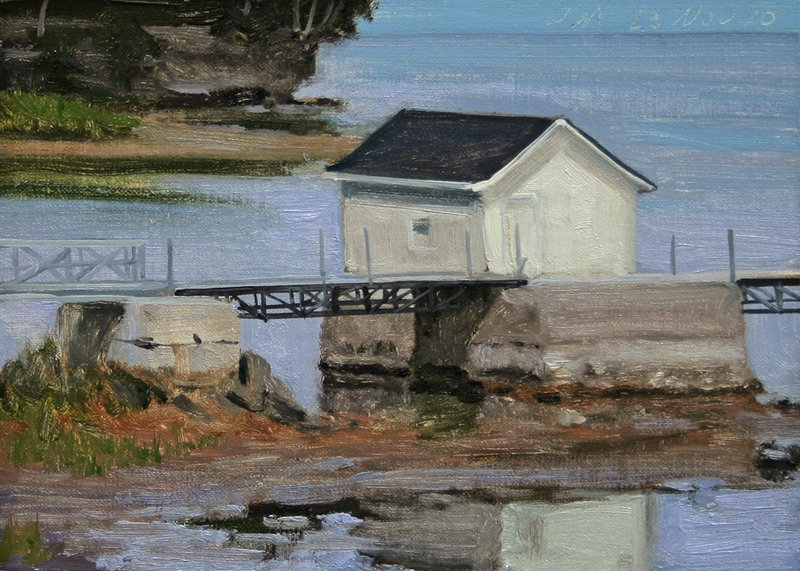 This view is of the pump house at Purdy's Dock seen from Cliff Rd. 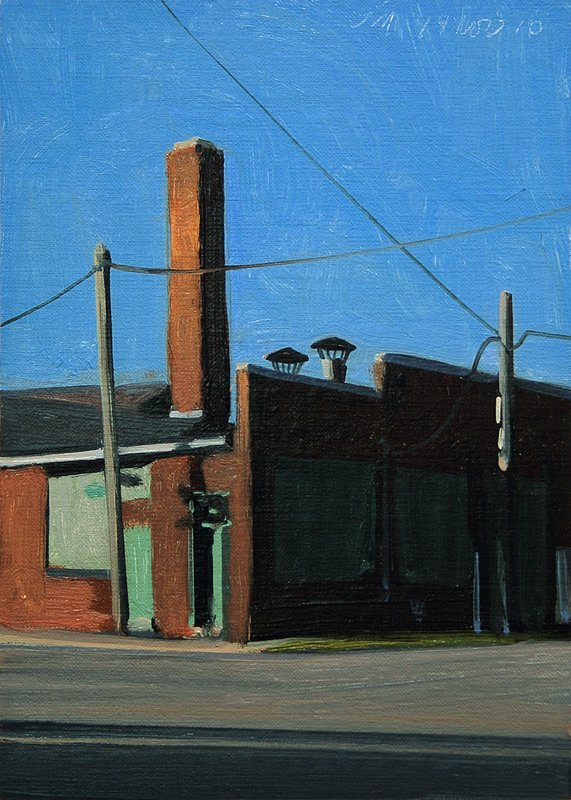 This daily painting is an urban landscape of a building on Woodward Ave. This building no longer is standing. 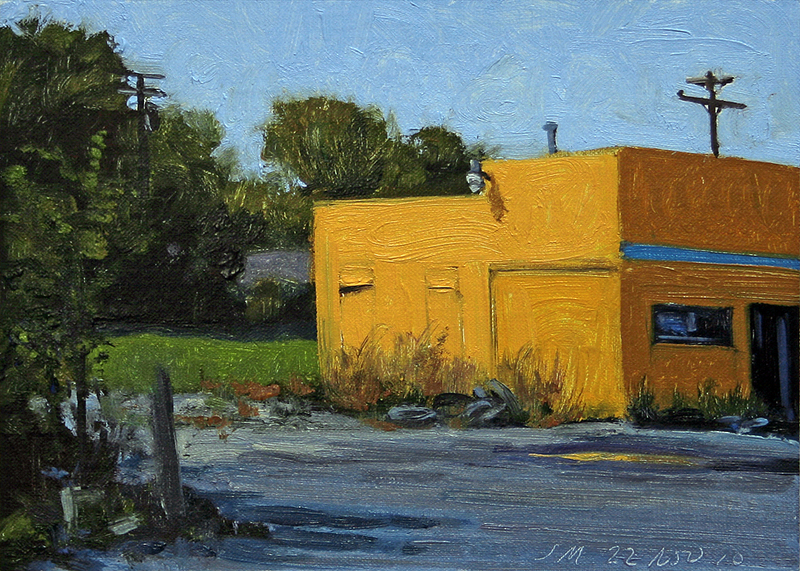 Detroit is trying to clear many abandoned buildings along Woodward Ave getting ready for a light rail system. 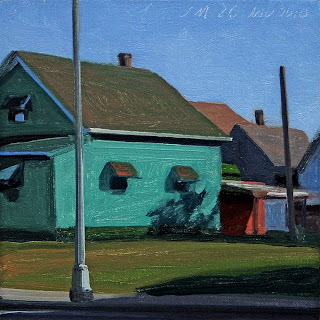 They are also hoping to tear down 3,000 more vacant structures, many on Michigan Ave and Gratiot Ave, to prepare for Re-Detroit. 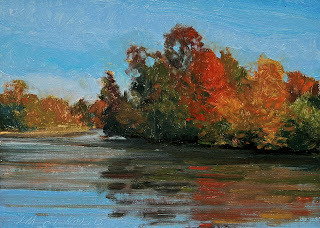 Click on link to see a current article in Metro-times. This daily painting is an urban landscape of sunlight on a beautiful house in the Brush Park area of Detroit. 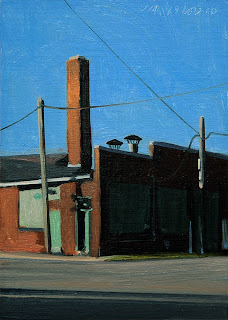 My 1,100th Postcard from Detroit painting. 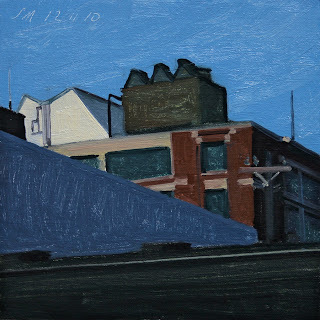 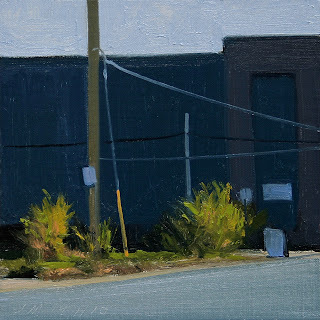 This daily painting is an urban landscape of sunlight and deep shadows on an industrial building at Church and Tenth St in Detroit. 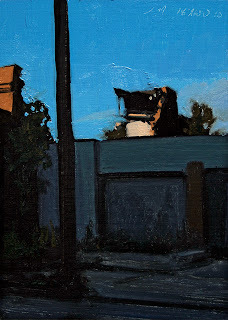 This daily painting is a dark and mysterious urban landscape of early morning sunlight and deep shadowed walls on Bellevue Street near Mack Ave on Detroit's East-side. 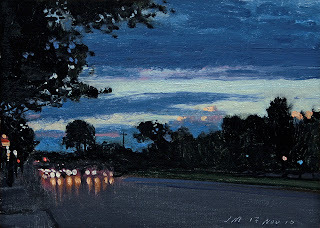 This daily painting is an urban landscape of automobile lights on Woodward Ave looking North from the end of our street. 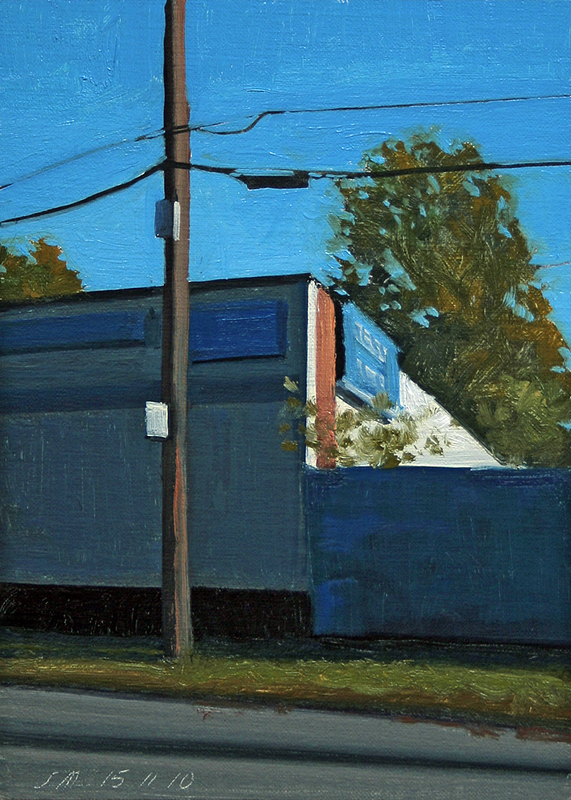 This daily painting is an urban landscape with sunlight and shadows against a deep blue wall. 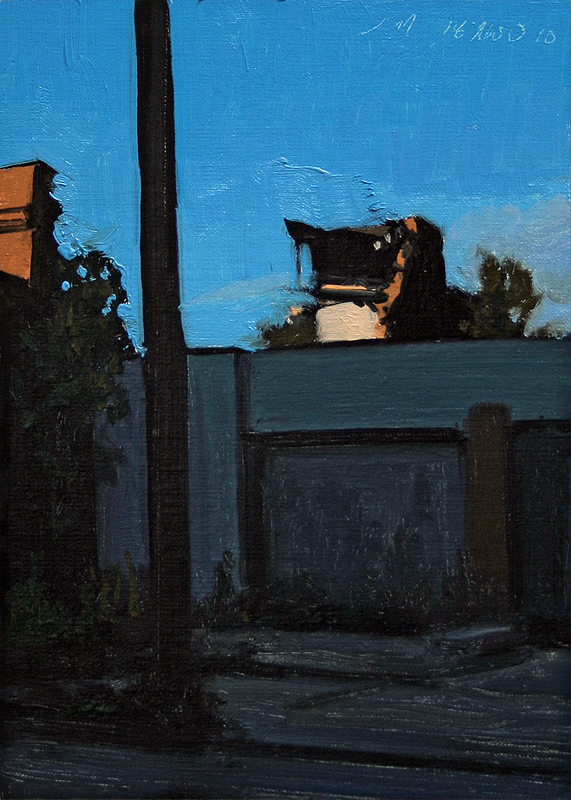 This scene is of West McNichols Road in Highland Park. 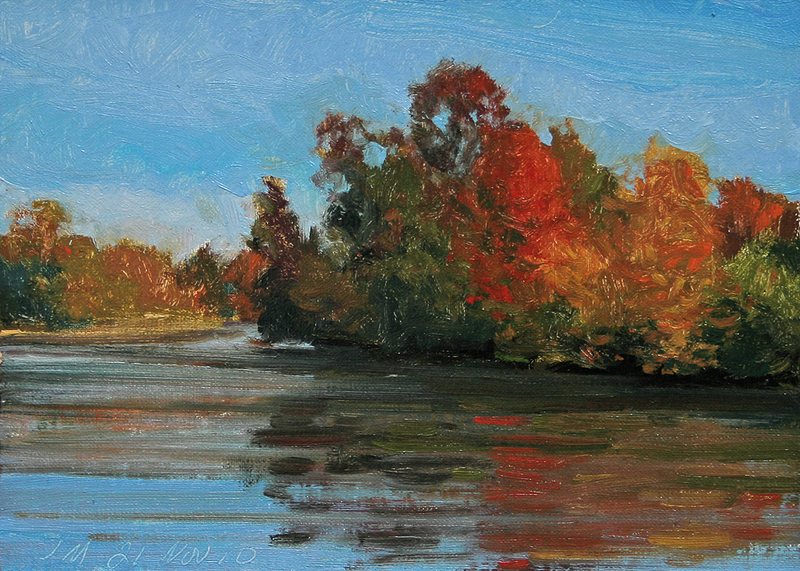 This daily painting is an urban landscape of a downriver industrial scene. 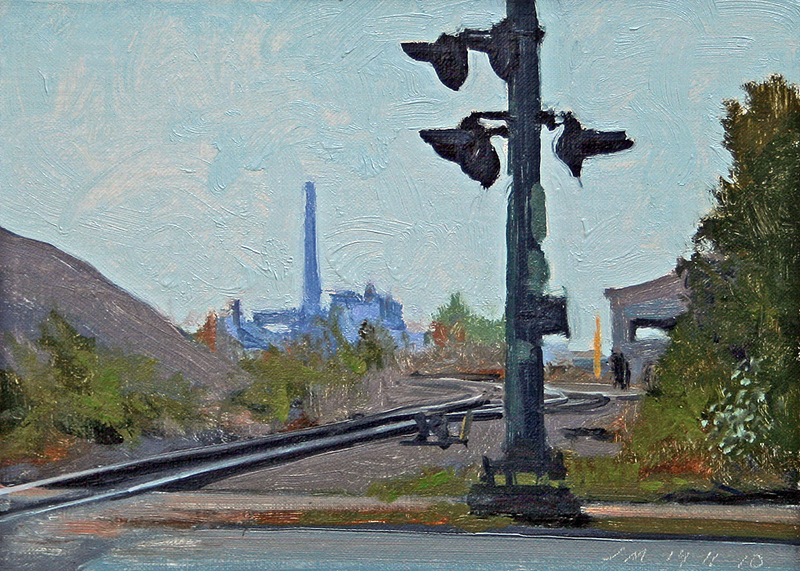 I really like when industry and nature collide. 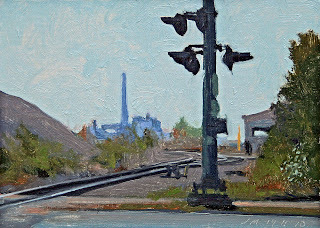 From Queen Annes Lace, RR tracks to smokestacks. 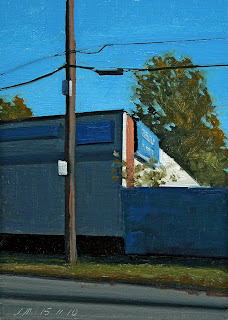 This daily painting is an urban landscape detail of the Ford Model T automobile plant in Highland Park. Designed and built in 1909 by Albert Kahn. 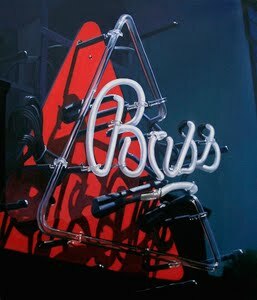 It was the home of the assembly line and once produced 1,000 T's a day.